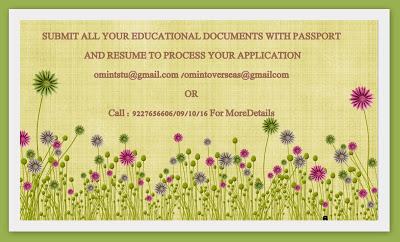 OM VISA Consultancy - Global Immigration, Students, Visitor, Business & Work VISA Consultants: STUDY IN FRANCE @ GUJARAT TOP LEADING VISA CONSULTANCY -OM INTERNATIONAL, VADODARA. STUDY IN FRANCE @ GUJARAT TOP LEADING VISA CONSULTANCY -OM INTERNATIONAL, VADODARA. The world's fifth-largest economy, France is also the fourth most popular destination for international students. The country remains committed to its long-standing policy of equal treatment for domestic and international students. France is on the list of best places in the world to attend university. Individuals of all ages can attend any of the fabulous colleges and universities in the country and expect to earn a great education. France is home to some of the best universities in the world, When it is a wonderful education that is desired, it is France that more people look to. A cheaper cost of living, the area and other factors also influence the decision of people to attend a university in France. Student is allowed to stay 1 Year after finishing the program.